For our family, the UPPAbaby Vista stroller was what we needed. We loved the basinet for the first few months and it comes with tons of accessories. 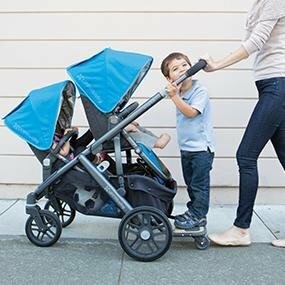 This stroller is easy to maneuver with one hand. It has a magnet system for the sun shade window so you don't wake up your little one with horrible Velcro sounds when you are peaking at them. It is a bit on the expensive side but if you are thinking of having more then one child, its a great investment. This stroller can be converted to a double stroller or you can add the piggyback board at the back for your older child. When you are done with your stroller, the resale value is amazing! After welcoming our second child we purchased the extra seat (rumble seat) to go on our 2014 model stroller. I was very disappointed to see that there are no extensions available for the basinet or the car seat and you can only secure it in one position (facing in), this leave very little room for our 2 year old son, unless we use the toddler seat. I would recommended buying a 2015 or newer model if you want to add the rumble seat as you will have more options available for your family.